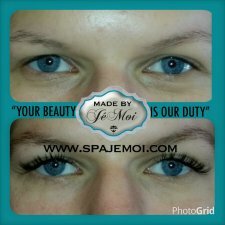 Wake up having beautiful luscious lashes! No more hassles of mascara and eyelash curlers. 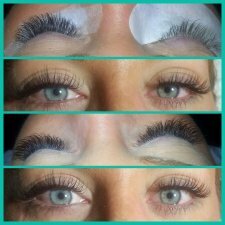 Semi-Permanent Eyelash Extensions will extend your eyelashes for a beautiful, dramatic, or a natural look and feel! Whether you want a beautiful look for a special occasion or just everyday wear, we have many options for you to choose from to achieve your desired look and style. These are synthetic extensions made of a polyester material. These lashes are thicker than the natural hair to give the illusion of a much thicker lash line, and they come in different lengths so that I can re-design an eye-shape. 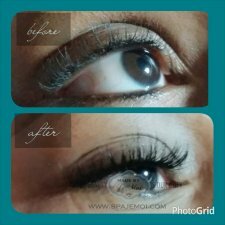 They are made to look like a natural perfect eyelash; thicker at the base thinner at the tip with a slight curl. There has been a lot of misrepresentation regarding this question. The truth is that a natural eyelash has only a 2 - 3 month lifecycle. In order to apply a synthetic eyelash to a natural lash, the natural lash has to be half the length of the synthetic hair we are applying - which means this hair could be a couple weeks or more into the natural lifecycle. With this being said, I apply a full set starting at 45+ lashes per eye, at two no more than three weeks a refill is required. This allows me to fill in any missing eyelashes to the new hairs that are growing. It also allows me to see how fast your eyelashes grow as everyone's growth cycle will be different. After this refill, you will have the option to keep up your lashes with continuous refills for as long as you wish or let the lash set you received grow out until all the lashes fall out. How often will I need lash refills? Clients come in for their refills anywhere from 2 - 3 weeks, with 2 weeks being the average. Generally speaking, if you are wanting to keep your lashes full all the time - I recommend scheduling your refills every 3 weeks. These extensions are a synthetic hair, which means they are completely sanitary and hygienic to apply to the human hair. 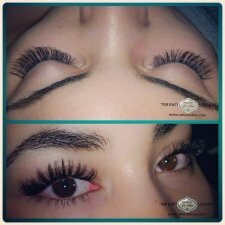 Be careful when you hear of someone applying a human hair lash or animal hair lash (i.e. mink) to your own lashes - these lashes are hard to sanitize completely and can cause major allergic reactions. We use a medical grade bonding glue - similar to the Derma bond glue used in surgical procedures. It has no fumes and because it only touches the eyelash hair - it will not cause an allergic reaction. How do I take care of my lash extensions once their on? 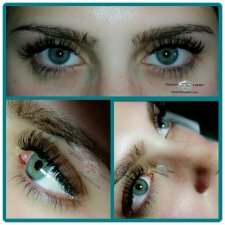 The semi-permanent eyelash extensions are wonderful because they will replace the need for mascara and provide a completely low-maintenance make-up routine. I advise you not to use any oil based makeup removers or products on the lashes or around the eyes. And should you decide to use mascara, only a water-based mascara can be used on these eyelashes. The best care for these lashes is to just leave them alone, which is why they are so great - you will revel in the time it saves you in the morning when you pop out of bed looking bright eyed as though your mascara and eye makeup is alreay done.